23 mins. to 28 mins. 21 hrs 38 mins. to 1 days 6 hrs 43 mins. This recipe, courtesy of our Whole Grain Baking book, makes dark, hearty, wheaty-tasting loaves. While not as light and crisp-crusted as the classic white-flour baguette, they'll still have lovely texture, full of the baguette's signature irregular-size holes. Note that this recipe includes two overnight rises, so plan your schedule accordingly. *Orange juice tempers the flavor of whole wheat, without adding any orange flavor of its own; but substitute water, if desired. To prepare the starter: Mix the starter ingredients in a small (2- to 3-cup) bowl, cover the bowl, and let rest overnight at room temperature. Next day, combine all of the dough ingredients, including the starter, in a large mixing bowl or the bucket of your bread machine. Mix and knead — by hand, mixer, or bread machine set on the dough cycle — to make a dough that's cohesive, but whose surface is still a bit rough. If you're using a bread machine, cancel the machine after about 7 minutes of kneading. Cover the dough, and let it rise for 3 to 4 hours, gently deflating it and turning it over once each hour; this helps oxygenate the dough (for the sake of the yeast), and redistributes the yeast. Turn the dough out onto a lightly greased or floured work surface, and divide it into three pieces. Shape each piece into a rough, slightly flattened oval, cover with greased plastic wrap or the cover of your choice, and let them rest for 15 minutes. Lightly grease (or line with parchment) a large (13" x 18") baking sheet. Working with one piece of dough at a time, fold the dough in half lengthwise, and seal the edges with the heel of your hand. Flatten it slightly, and fold and seal again. With the seam side down, cup your fingers and gently roll the dough into a 16" to 17" log. Place it on the prepared baking sheet. Repeat with the remaining pieces of dough, spacing them evenly lengthwise on the pan. Cover the loaves with heavily greased plastic wrap, tenting it over them gently. Allow them to rise for 30 minutes. After 30 minutes gently remove the plastic wrap, grease it again, and re-cover the loaves. Again, drape the plastic gently; you don't want to anchor it to the sides of the pan. Next day, let the loaves rest at room temperature, covered, for about 1 1/2 hours. Towards the end of their rising time, preheat your oven to 425°F. Uncover the loaves. Spritz them with warm water, and make 3 or 4 diagonal slashes in each, if desired; this will help the baguettes rise more evenly, but if you're afraid of slashing, that's OK. Also, if you do slash, the loaves may start to deflate alarmingly; they'll be fine if you get them into the oven ASAP, so don't dawdle. Note: For extra-crusty baguettes, forgo spritzing the shaped loaves with warm water and add steam to your oven as detailed in "tips," below. Place the pan on a middle oven rack, and bake the baguettes for 18 minutes. Tent lightly with foil, and bake for an additional 5 to 10 minutes, until they're a deep, golden brown, and their sides and bottom are hard/crisp, not soft/spongy. Remove the baguettes from the oven. Turn the oven off, crack it open a couple of inches, and place the baguettes on the oven rack (without the pan) to cool; this will increase their crisp crustiness. 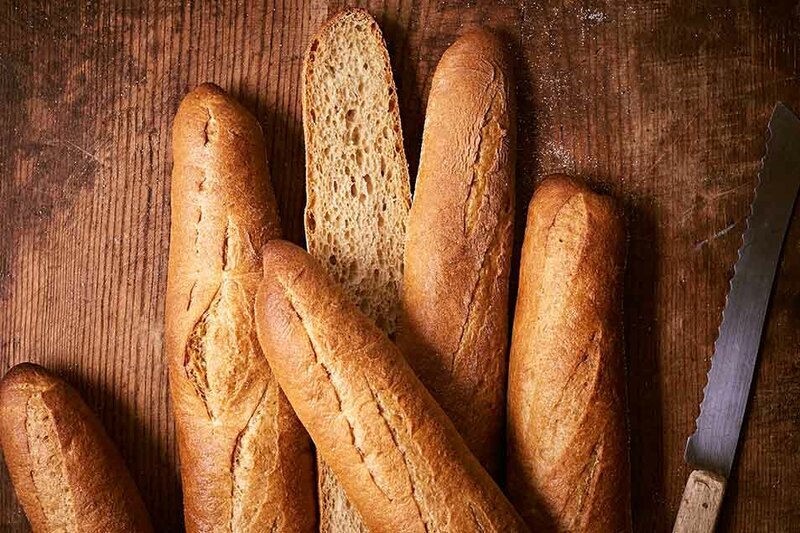 Serve baguettes the same day they're made, if possible. If not, store loosely wrapped (not sealed) in plastic; just before serving, heat in a preheated 350°F oven, tented with foil, until warmed through, about 10 minutes. If your house is very cold at night, try to find a somewhat cozy place for the overnight starter. You don't want it really warm, but about 65°F-70°F will keep it happy. Near (not on) the wood stove or another heat source, or atop the water heater, would be good choices. Can you bake these loaves on a pizza stone? Sure. The easiest way is to line your baking sheet with parchment, let the loaves go through their refrigeration on the baking sheet, then lift them, parchment and all, onto the hot baking stone when they're ready to bake. For extra-crusty crust, add steam to your oven as follows: While the oven is preheating, place an empty cast iron frying pan on the oven rack below the stone. If possible, adjust stone and pan so that the pan isn't directly under the stone, making it easier for steam to reach the baking bread. Once you’ve placed the bread in the oven, pour about 1 cup of boiling water into the cast iron frying pan. Steam will billow from the pan upwards to envelop the baking bread; be sure to wear good oven mitts to shield your hands and arms. Quickly close the oven door to trap the steam.